WISER was a large EU-funded research project, which was finalized in February 2012. The acronym WISER stands for “Water bodies in Europe – Integrative Systems to assess Ecological Status and Recovery”. Similarly to REFORM, WISER supported the implementation of European policies in the field of environmental protection, in particular the Water Framework Directive (WFD). While REFORM is focusing on rivers and hydromorphology, WISER mainly dealt with lakes and marine ecosystems (to a lesser degree with rivers) and addressing both assessment and restoration. Many of the WISER results, however, are of relevance for REFORM. Amongst other, WISER produced a large database with biological assessment methods applied by the European countries to judge the quality of their water bodies – more than 300 methods are presently in use, and more than a quarter of the methods aim amongst others to assess the effects of hydromorphological degradation on the biota (http://www.wiser.eu/results/method-database/). A main part of WISER addressed the development and intercalibration of biotic assessment methods for lakes, coastal and transitional waters. While most countries developed WFD-compliant assessment methods for rivers already some years ago, the development process for lakes and marine ecosystems lacks behind. WISER contributed to filling this gap, and particularly supported the so-called “intercalibration exercise”, which tested if the methods applied in different countries deliver comparable results. The intercalibration of assessment methods is a complex process, as a multitude of methods addressing fish, benthic invertebrates, macrophytes and plankton in rivers, lakes and marine ecosystems were compared. In most cases, a yardstick for comparison was provided by so-called “common metrics” against which all the methods were compared – WISER developed such common methods and advised the groups of countries responsible for intercalibration. While the development and intercalibration of assessment methods was by far the largest part of WISER, three “work packages” have addressed ecological restoration in rivers, lakes and marine ecosystems. In case of rivers, this exercise started with generating “cause-effect-recovery-chains” by synthesizing literature and expert knowledge (see Figure below). These chains describe how biotic assemblages are supposed to change following degradation and restoration. 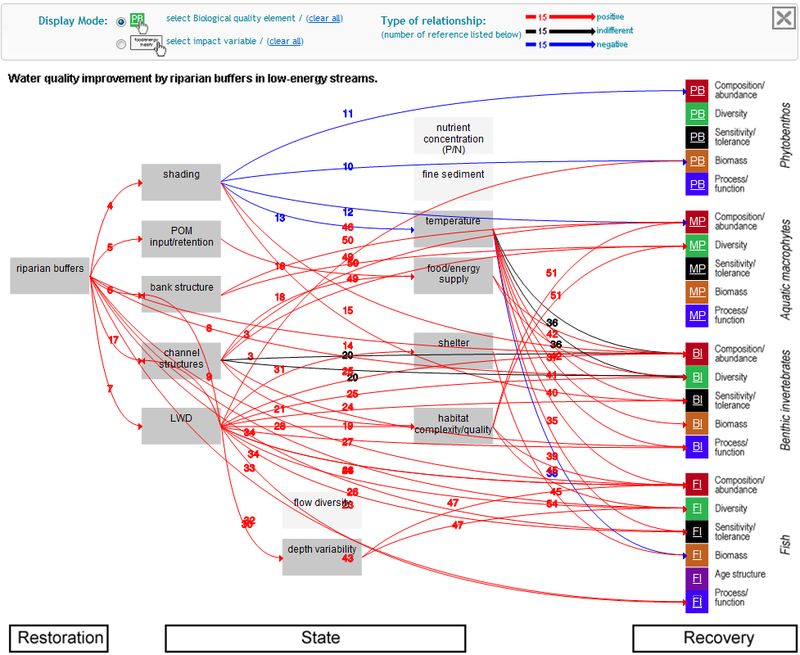 The chains are provided in an interactive form on http://www.wiser.eu/results/conceptual-models/. The analysis of large data sources, which resulted from monitoring under the WFD, revealed the overarching effect of catchment and riparian land use on river ecological status, while the effects of local hydromorphology are significant but smaller. These results are in line with the approach of the WFD, which asks for river basin management plans and thus moves away from simply restoring small single rivers stretches. This pattern is further supported by the comparative analysis of river restoration effects. Also here, it is apparent that the situation in the catchment largely determines what can be achieved through restoration. And last but not least: recovery of degraded water bodies takes time. Even if stress intensity has successfully been reduced, biotic recovery might take one or two decades.